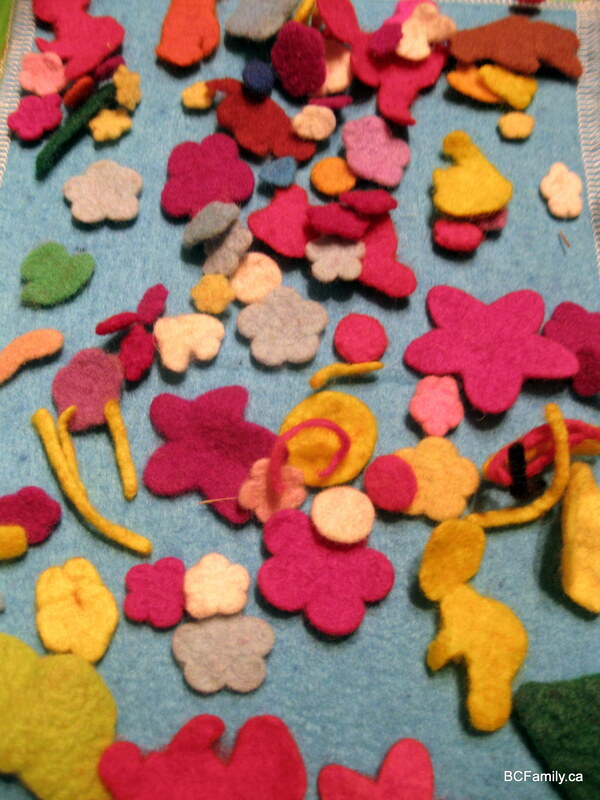 Felt pieces laid down by a two year old. Do felt boards take you back to your early childhood days? If you have been to a local library lately with your children, grandchildren or students you may have watched the librarian tell a story using a felt board. These familiar devices have also been used in elementary classrooms for decades and can be found in Strong Start programmes and preschools across British Columbia. Do you recall how magical it felt, when you were a child, to watch a story unfold as a librarian, teacher or parent slowly added felt characters to a board? A felt board and related felt pieces also makes for an ideal at-home activity for your child. Here’s how you can make a board for your home. 1. Find a container that you will use for your felt pieces. In the photograph shown below you will see that we used an empty Purdy’s chocolate box. You can also go to a dollar store and look for clear plastic boxes that are used to hold buttons or small pieces of jewellery. We liked the chocolate box because it’s easy to close, there were spaces of different shapes and sizes and the felt boards can fit on top of the storage area. 2. Visit your local craft store, or the storage area of a sewer you know, and find felt in a wide variety colours. Choose felt that has some thickness to it so that it can be handled easily. 3. Draw out the shapes that you would like to create for your board on a piece of paper. Cut out your templates. Using a thin, black felt marker or fine ballpoint pen, trace the shapes onto your felt. Create multiples of generic shapes such as flowers or circles, but create only one or two shapes of a specific animal, for example. 4. Cut the felt out using sharp scissors that can cut fine shapes. Sharp nail scissors are a good option. 5. Here are some suggestions for outlines of shapes that you can cut out. You can repeat one shape in different colours. You can also create shapes in different sizes. For example you can have very small, small, medium and large sized flowers in the same colour of felt. 6. You will also need to create two felt boards that will fit into your storage box. * Cut two pieces of thick cardboard. * Cut four pieces of felt a little bit bigger than the size of your cardboard. * Use a machine or hand stitch the edges around the cardboard to seal it closed. * Choose a colour for the felt board that will be in contrast to the felt colours that you used for the pieces. 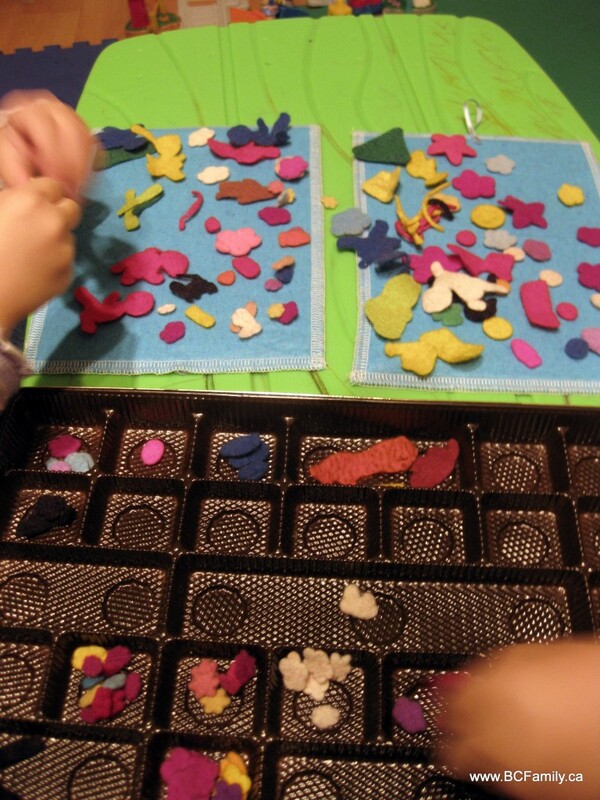 Two year olds working with the felt board and pieces. For this type of felt board you are not trying to create pieces for a specific story. Your child will be able to create his or her own stories using the variety of pieces that you have cut out. When you show your child how to use the felt boards emphasize that the pieces need to be placed in their compartments and that the clean up process should be thorough so that no pieces go missing. Very young children – such as toddlers – will find it difficult to categorize the pieces when they place them back in the box. You will need to reorganize the box from time to time. If the idea of this project excites you, you will be interested to know that people who have seen these felt boards in use have been enthusiastic about what a wonderful and simple idea it is. If you decide to make your own felt boards and pieces, we’d love to see a photograph of your project. This is the perfect project for a parent, older child, grandparent, auntie, uncle or friend to make for the children in their lives and makes an ideal gift. If you would like to find felt pieces related to a specific story, check out the 3 H craftworks information and link related to how to make a felt board more options.